The store had bing cherries on sale, and we brought a couple pounds home, only to find that they needed to be used asap. 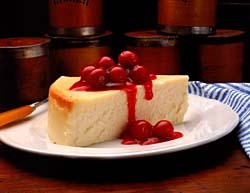 So…what better use for cherries than cheesecake! Everyone loves a good cheesecake. Heck, folks love a bad cheesecake, but a good one is even better. When making cheesecake, I use a 7″ x 4″ inch spring-form pan, because I prefer fluffy tall cheesecake, rather than dense, short cheesecake. But this recipe can be used in a 9″ x 2″ pie pan just as easily. Cream eggs, sugar, salt and vanilla together. Add cream cheese and beat until smooth. Set your mixer to medium, and whip the ingredients for 3 minutes. For the tall spring-form pan, bake for about 40 minutes or until filling is set and a knife inserted into the center comes out clean. For a 9″ pie pan, check at 20 minutes, and then every 5 minutes until set. In a springform pan, while the cake is still warm, run a cool, clean knife around the inside perimeter of the pan, so that when the cake cools and contracts, it doesn’t crack. Pit and stem 4 cups of cherries. Stir in cherries. Cook and stir until thick and bubbly. Cook and stir for 1-2 minutes more, then remove from heat, cover and let cool without stirring. I am seriously going to make this recipe some day. It is yummy. Also, no calories. I read on the internet that online recipes never have calories. And nothing on the internet is ever wrong.